This amazing ultra-hydrating Hand and Body Cream provides all-day moisture for sensitive, allergy prone and fragile skin. This amazing ultra-hydrating Hand and Body Cream provides all day moisture for sensitive, allergy prone and fragile skin. Enriched with a critical combination of 15 natural actives working together to make it a lot more than just a moisturiser, it will help make your skin feel fresh, glowing and healthy. Moisturisers are not all the same. Several contain Colloidal Oatmeal, an effective and long-lasting moisturising ingredient and anti-irritant but this alone is not sufficient. To be a truly effective it is essential to incorporate a combination of Beta Glucan, Ceramide and Cholesterol. These and more natural active ingredients included in this wonderful lotion keep it a leader in the functional moisturiser market. The key ingredients are Colloidal Oatmeal, Beta Glucan, Omega-6 Ceramide, Wheat Germ Oil, Vitamin B3 and Hydrolysed Collagen. These ingredients are known to help in the relief of the symptoms associated with contact dermatitis, rashes, extreme dryness and itching skin. Massage thoroughly into hands and over the body. Use several times a day for best results. Purified Water (Aqua), Lavandula Angustifolia (Lavender) Flower Water, Glycerin, Stearic Acid,Pentaerythrityl Tetraisostearate, Rosa Eglentaria (Rose Hip) Seed Oil, Avena Sativa (Oatmeal) Kernal Powder, (Oat) Beta Glucan, Propylene Glycol, Cetearyl Alcohol, Butyrospermum, Parkii (Shea Butter), Capric/Caprylic Triglycerides, C12-15 Alkyl Benzoate, Glyceryl Stearate, Carbomer, Tocopheryl Acetate, Sodium PCA,Dimethicone, Niacinamide, Allantoin, Hydrolysed Collagen, Phenoxyethanol, Sodium Hyaluronate,Chamomilla Recutita Flower Extract, Caprylyl Glycol, Potassium Hydroxide, Lavandula Angustifolia (Lavender) Oil, Citrus Sinensis (Orange Sweet) Oil, Citrus Paradisi (Grapefruit Pink), Litsea Cubeba (May Chang) Oil, Pogostemon Cablin (Patchouli) Oil, Jasminum Grandiflorum (Jasmine Absolute), Cholesterol, Wheat GermOil / Palm Oil Aminopropanediol Esters (Omega 6 Ceramide Wheat Germ), Dipotassium Glycyrrhizinate, d-Limonene, Linalool. 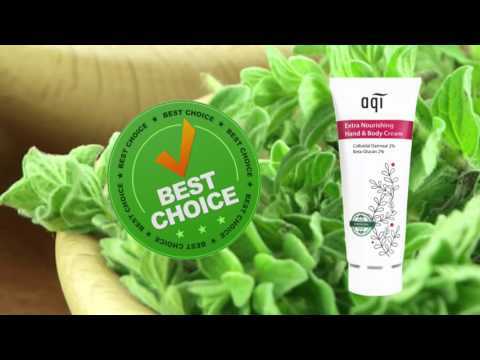 I have been using the AQI Extra Nourishing Hand & Body Cream on my hands for the past few weeks. The results have been fantastic, I normally have very sensitive skin on my hands and as a result I find that the sensitivity results in infections. Using the Hand & Body Lotion has changed that, my hands are softer, the skin is more resilient and my nails are no longer breaking - all in such a short time! I am extremely excited that just using this product twice a day has had such a positive result! I used have Aqi skin products because I get really sensitive hands as I have to wash them so in my job much, I use the Aqi Hand cream so as to stop them getting so sore. Lovely product work for skin like mine and superior to anything else I have tried in the past.